As the use of vaporizers continues to rise year on year, more and more people are entering the space for the first time and are often left confused about how best to use their vaporizer. I know from my own experience of my father who started conventional tobacco smoking when he was 19, and continued up until he was 52, before first using a vaporizer. Its like teaching an old dog new tricks! It takes a little bit of practice, patience and persistence in order to perfect the art of vaping. So we thought we’d offer a few tips in order for you to get the most out of your vaporizer. One of the errors first time vapers commonly make is with the dryness of their material that they use – closely followed by how finely ground the material they are vaping actually is. If I am being honest, when I first began vaping, I didn’t really understand why the dryness of the material was so important. I think its true that a lot of people would be suprised and shocked to find out that moisture in the herbs or material would make it very difficult to vaporize. I thought the opposite to be the correct way to vape – my reason being that the increased moisture would lead to more vapor being generated as it is heated by the element. I’ve actually found that you will get more vapor (oh…and tastier vapor), if your material is bone dry. If your material is moist, it will cause the vapor to be quite harsh. I’m going to show you a method that works particularly well for me. Don’t worry, you won’t need to purchase any new products in order for you to be able to do this. This method I am going to tell you about is an easy to use…and most importantly…free way to dry your herbs ready for vaping! First of all, I will take my Golden Gate Grinder. To kick off, all I do is I grind up my material in the Golden Gate Grinder. A quick aside, if you are experiencing problems with your grinder building up a lot of residue in a short period of time, or if the material blocks inside the grinder and its taking a lot more effort to grind than it normally would’ve needed, it means that the material is too damp. Once the grinding process has been completed, it is time to move on to the next stage. So what I do is that I take a piece of A4. Another aside (I promise not to do this too often! ), if you want to keep the process completely organic, or if you are worried that some of the contamination from the paper will interfere with your material, I would recommend buying some craft paper. For example, if you could get a hold of brown paper like they have in the grocery stores, that would be perfect since this sort of paper is not bleached with any products! So if you remove your material right from the Golden Gate Grinder and insert it straight away into your vaporizer, it’ll work. But if you want a superior vape, I would recommend taking the material from your grinder and carefully lay it out over the piece of paper. Leave the material resting on the piece of paper for around 10 to 15 minutes before your dry herb vape. That’s all the time you require to leave the material drying for since the material is already quite fine, and because you’ve spread it evenly over the paper allowing a larger surface area for the material to dry faster. It’s like the effect of hanging your washing out to dry – it is never going to dry if it is all clumped together on the floor. You need to lay out each garment individually in order for it to dry. After the ten to fifteen minutes have passed, what you are left with is an almost crispy like material that will work spectacularly if you insert it into the vaporizer. 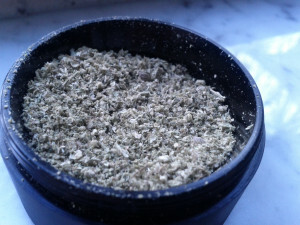 This method works excellently with my Golden Gate Grinder and it should work with yours too. I’ve found the grind consistency of the Golden Gate Grinder to be perfect for vaping. Depending on which vaporizer you use, for example the Launch Box, some vaporizers may require you to take the dried material that you’ve laid out on the paper and complete a second grind. If this is the case, grind the material even more with the Golden Gate Grinder as before, and lay out for maybe five minutes longer than the first iteration. So in summary, if you want to get a better vaping experience, then try this technique out and let me know how you get on! If you do a simple Google search of people having problems with their vaporizer, I’d personally say that 90% of the problems that people express online can be easily solved using this paper drying technique – or by grinding their material with a top of the range grinder such as the Golden Gate Grinder. But don’t get me wrong, some vaporizers that people do use just aren’t up to the standard to produce an enjoyable vape. So make sure you do your research, read reviews of the vaporizer you’re looking to buy. See the purchase as an investment and invest in a top of the range vaporizer and a top of the range grinder like the Golden Gate Grinder, which can be bought on Amazon through this link here. Happy vaping!